I enjoyed the wonderful sunny day at Fisherman's Terminal with all of you! For a few hours we shared living out one identity we have in common: that of being an artist from Urban Sketchers Seattle--recognizable this past Sunday because of our sketch books in hand, sun hats on our heads, and the gloss of sun block on our exposed body parts, each blissfully drawing, sketching, or painting away. To be repeated, I hope, indefinitely. Thanks Beth. Wouldn't it be fun to have two (or more) such fun means of transportation? Think of all the places one could go---to sketch, of course! So glad to see your beautiful motorcycle drawing here! I have been pinned down away from home until tonight; I will post soon! 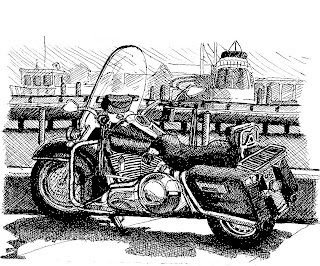 Frances I posted a picture of "your" motorcycle on Flickr and my blog -- not as impressive as your powerful drawing! Thanks for your nice comments, Tyler. I've been away too--at a Lois Griffel workshop at Cannon Beach---and now back home only to be tethered to our A/C, as today, the weatherman promises 103 degrees in Puyallup! Not outdoor sketching weather! Hope you can make it to Gas Works on the 23rd!